With so many malls to choose from inside Toronto's city limits, it may seem like a strange idea to venture north into Vaughan just to shop. But going to Vaughan Mills can turn mall-shopping into a real event. So if you've never been, you should check it out at least once. Just make sure you've got a lot of time on your hands since there's so much to see, do and buy. Here's everything you need to know before you visit Vaughan Mills Mall. Part of what makes Vaughan Mills so big is the size of the stores themselves. Well-known names like Sephora, Saks Fifth Avenue OFF 5TH, hr2 Holt Renfrew, Forever 21, Winners/Homesense, Hugo Boss Factory Store, MAC Cosmetics and Cole Haan are all there (to name just a handful), then when you add the massive shopping/entertainment crossovers like Bass Pro Shops Outdoor World, you've got a lot of browsing to do. Outside of big names and big square footage, Vaughan Mills has at least one of just about everything you'd expect from a mall, and sometimes a dozen or so. They're heavy on fashion and confections, and also have lots of home decor and tech stores to choose from. Inside the mall you'll find a plenty of official entertainment spots, and additional areas that can turn shopping into a real event. Bass Pro Shops Outdoor World is technically just a store, but the shooting arcade, giant aquarium and decorative plane make that debatable. Families can spend some time checking out LEGOLAND Discovery Centre, filled with LEGO-themed activities and experiences as well as a cafe. Kids will also likely love the Build-A-Bear Workshop where they can build their very own teddy bear. You can enjoy pan-Asian cuisine at Szechuan Szechuan or grab a sandwich, burger or salad from The Pickle Barrel. In the center of the mall you'll find the food court with options to suit every taste including Taco Bell, A&W, Cultures, Thai Island, Jimmy the Greek and KFC among other fast food or fast-casual outlets. Around the mall there are also plenty of coffee, candy and other specialty shops to choose from including Starbucks, Tim Hortons and Purdy's Chocolates. Vaughan is immediately north of Toronto if you head up the 400. The mall is located on Rutherford Road, immediately east of the highway (coming from the south you can use the Bass Pro Mills Drive exit). If you'd rather avoid the 400, you can head all the way up Jane and enter the mall by turning left on Riverock Gate, one street south of Rutherford. Depending on when you're visiting, using Vaughn Mills' shuttle service makes reaching the mall fairly easy. Their 55-passenger shopping shuttle provides free round-trip transportation from Toronto's Union Station to Vaughan Mills twice a day, between June 1 - September 30 and November 24 - December 26 (excluding Christmas Day). If you want to reserve a seat on the shuttle, you'll need to register with the City Tours Attractions representatives near Union Station. Identification bracelets to ride the shuttle are distributed on a first-come, first-served basis starting at 8:30am. Shuttle registration and boarding takes place at 123 Front Street West, on the south side of Front St., between York St and Simcoe St, and drops off at Entry 6 once you get to the mall. Several York Region Transit routes go directly to Vaughan Mills, but this means you'll have to transfer off of TTC and pay another fare. One option is to take the TTC to Downsview Station and get on the 107C, 107D, or 107F Keele Northbound. These buses go all the way up to Rutherford Road, but you'll have to pay an additional $3 York Region Transit fare to ride them that far. Be sure to get a transfer so you can get on York Region Transit's westbound 85 Rutherford bus, which will pull right into the Vaughan Mills loop before continuing on its route. Vaughan Mills is wheelchair accessible, all built on one level with automatic doors and wide hallways. Individuals who have trouble walking or standing for long periods should plan carefully where they park, as the distance between the ends of the mall is a long way to go. The mall website has a map in the directory section that can help you plan where to park. Alternatively, the guest services booth (near H&M) has wheelchairs and motorized scooters available. Bass Pro Shops is open 9am to 9pm Monday to Saturday and opens at 9am to 7pm on Sundays. Pro Hockey Life is open 10am to 9pm Monday to Saturday and 10am to 7pm on Sundays. Toys 'R' Us is open 9am to 10pm Monday to Thursday, 8am to 11pm Friday and Saturday and 9am to 8pm on Sunday. 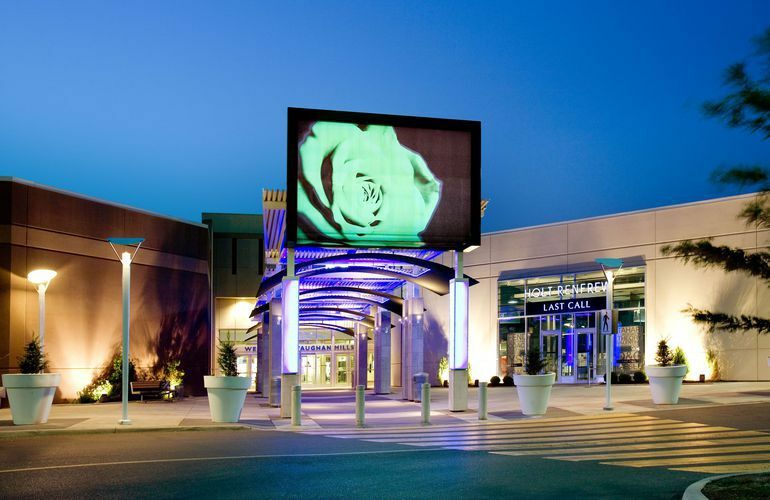 There are many amenities at Vaughn Mills to make your shopping experience more comfortable and efficient. In addition to a guest information booth, the mall also boasts free Wi-Fil, lockers, stroller rentals, family parking, 24-hour security and emergency diaper change kits ($1 each). You can also browse the mall's blog, Ideas, for shopping tips and style inspiration. What Are Jacksonville's Best Malls and Shopping Centers?